After dominating the 125cc and 250cc categories by earning three consecutive World Championship titles from 2003 to 2005, Dani Pedrosa has become one of the most successful riders in Honda’s history and has achieved more podium finishes for the Japanese manufacturer than any other rider, with a total of 153. 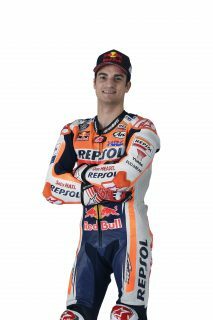 In addition, Dani has won at least one race per year for the last 16 seasons on his way to becoming the seventh most successful rider in history. During the 2015 season, he won the Japanese and Malaysian rounds and, at the season-closing race in Valencia, reached the milestone of 100 premier-class podium results. Dani had a difficult start to the 2016 season, despite posting two third-place finishes, but came on strong in the second half, taking his 29th MotoGP win in Misano. The 2017 season was much better for the Spaniard, who took two wins, in Jerez and Valencia, and a total of nine podium finishes, eight of which were alongside teammate Marc Marquez, helping to make the Repsol Honda Team the most successful MotoGP squad of 2017. 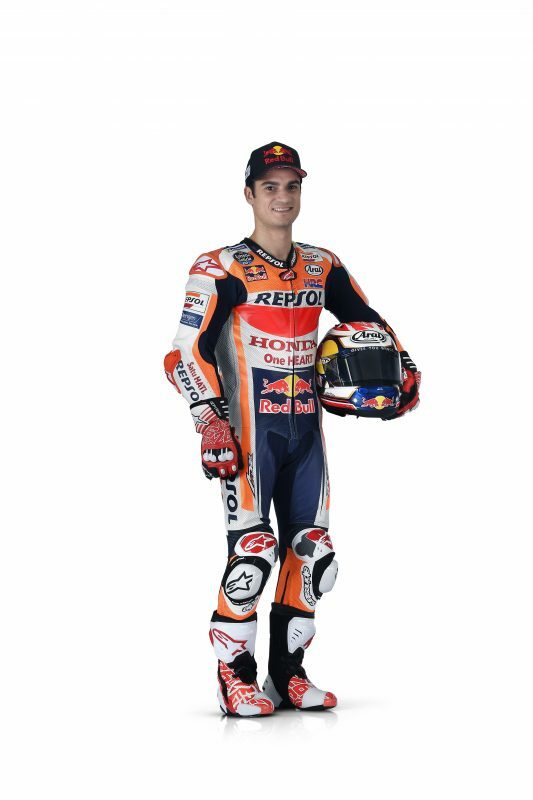 The first time Dani Pedrosa got on a motorbike was at age 4, and by the age of 6 he had begun racing minibikes. Other motorcycles followed, as did circuits and races with friends, always for fun and not even imagining what the future held. It was in 1996 when the 10-year-old Pedrosa entered the Spanish Minibike Championship. He began racing on karting circuits all over Spain, always joined by his parents and with the bike in the car trunk. Dani finished his first race in sixth position due to a problem with his bike’s exhaust pipe, but the second race brought his first podium finish. He enjoyed the experience and, after finishing second overall in his first season, decided to enter the same championship the following year. Unfortunately, a few days before the 1997 season, Dani caught chickenpox and wasn’t even able to put on the helmet. At year’s end he finished eight points behind the leader in the third position overall. Although Dani managed to take the title in 1998, he still considered racing a mere hobby. The Aprilia 50 Cup and the Open RACC were popular promotional series at the time, and Pedrosa considered giving one of them a try. However, due to the lack of means and support—and despite his good results—Dani decided to leave motorbikes aside and to change over to mountain bikes. When he was just about to get his bicycle-racing licence, his family heard from a friend that the Movistar Activa Cup, a promotional series with competition bikes, was being organised. A step up from minibikes to racing bikes would be huge for young Dani, but in early 1999 the Pedrosa family decided to send an entry form to take part in the try-outs, which would be held at the Jarama circuit in Madrid. The weekend before the trials, Dani learned to ride a bike with a gearbox in an industrial area nearby his home, riding a borrowed bike. The try-outs would be his first time on a circuit, and understandably, he was nervous; the bike was so tall that his feet couldn’t reach the ground. Nonetheless, the 13-year-old made the cut to take part in the Movistar Activa Cup that year, and he went on to finish in a meritorious eighth position. Of the 25 riders taking part that year, only three were selected to become part of a team run by Alberto Puig, who saw Dani’s huge potential and included him along with with Joan Olivé and Raul Jara. In 2000, Dani took part in the Spanish Championship with the Movistar Junior Team. He finished four of the six races and took four poles, finishing fourth overall behind Olivé, Jara and Toni Elias. 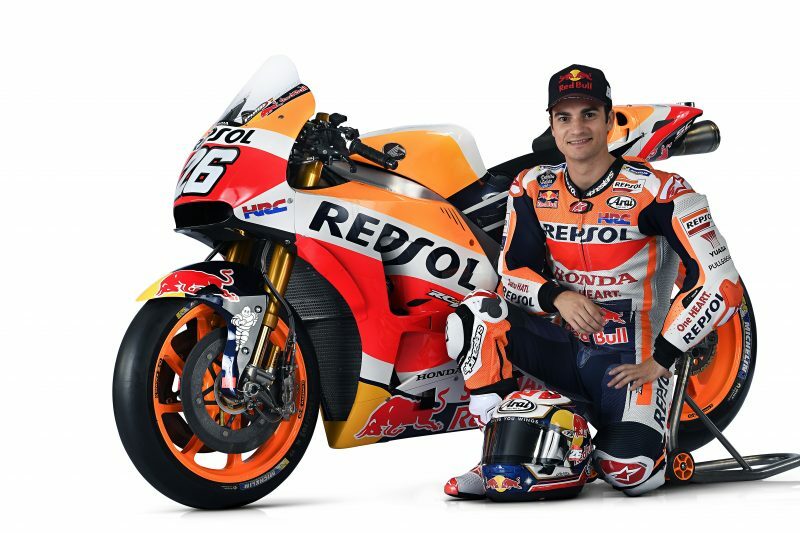 This prompted Puig to have Dani take part in the 125cc Motorcycle World Championship. Pedrosa, then 14, couldn’t believe it; his dream was coming true. In the first race, held at Suzuka, the Spaniard was among the last riders on the grid, as he had never seen such a competitive class. He still remembers feeling scared in the first corner, something that never happened again. Even though 2001 was a learning year for Dani, he managed to take two podiums finishes—a third place in Valencia and another in Motegi. He started several races among the leading riders, and despite his lack of experience, he raced alongside well-known riders such as Elias, Manuel Poggiali and Youichi Ui. He finished eighth overall in the final standings. Pedrosa’s third-overall position in the 2002 World Championship, in which he had been a title candidate along with Poggiali and Arnaud Vincent, was the evidence of his tremendous potential. This fact was confirmed by the nine podium finishes and six pole positions he took that year, as well as by his three victories, in Assen, Motegi and Valencia. Although he had to settle for the third place, Dani was considered the most spectacular and combative rider in the class. 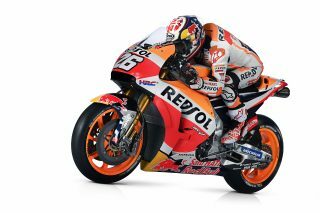 Pedrosa faced his third year in the 125cc World Championship with serenity and determination, as well as the aim of clinching the title. During the season, he showed the maturity of a veteran rider—not an 18-year-old—and he earned a reputation for being one of the most talented young riders in the sport. He became 125cc World Champion in Malaysia, with two GPs left on the calendar, after collecting five victories and six podium finishes. Only one week later, misfortune hit the young rider, who suffered a huge accident during a practice session at the Australian GP, breaking both ankles. In 2004, following a difficult recovery period and under the protection of mentor and right-hand-man Alberto Puig, the young rider decided to make the jump to the 250cc class. From the beginning, Dani considered it a season of learning and adapting to the class, with no real ambition of fighting for the title. That said, he surprised everybody right from the first tests of the season, as hard work and dedication from the rider and his entire team soon bore fruit. He tasted victory in the first race in South Africa after a spectacular fight with Randy De Puniet, and he took over the championship lead after the Brazilian Grand Prix, keeping it until the end of the season. In Australia, Pedrosa became youngest 250cc World Champion in history, in his rookie season in the class, at the age of 19. In addition to the seven victories, it was his incredible consistency throughout the year that gave him the title. The only races in which he didn’t finish on the podium were Jerez (where he crashed in heavy rain), Estoril and Phillip Island (where he finished fourth). With more experience and maturity, Dani faced his second 250cc season as the heavy favourite. The considerable competition he had to face, the adverse weather conditions at the beginning of the season and the shoulder injury he suffered during practice at the Japanese Grand Prix turned 2005 into a difficult year for the Repsol rider, but eventually, a 51-point lead was enough to clinch his third GP crown at the Australian GP in Phillip Island, two races before the end of the season. 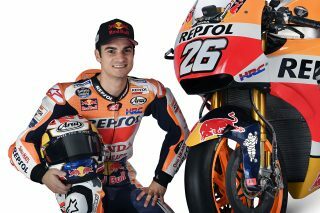 With three World Championships under his belt, the time for Pedrosa to make the definitive jump into the MotoGP World Championship arrived in 2006. Once again, with the on-going help of Alberto Puig, the change of category was planned with the care necessary for a challenge of this magnitude, as Dani focused on learning and adapting to the significant differences between a MotoGP bike with over 240bhp and weighing 150 kg, and a 250cc bike with around 90bhp and weighing just 100 kg. The tough physical training carried out over the winter, and constant progress in pre-season training sessions, were the prelude to his extraordinary debut in the category, where he was proclaimed Rookie of the Year after tallying two wins, six podium finishes and fifth place in the overall championship standings. In the first Grand Prix of the year, held in Jerez, the first glimpse of Dani’s talent had already begun to dazzle everyone, both inside and outside his own team. At just 20 years old, he posted in an incredible runner-up finish, just a few tenths of a second behind the winner, veteran Loris Capirossi. Pedrosa continued to shine in the following races, with varying fortune. In Turkey he fell on the final lap while battling for the lead with Marco Melandri and Casey Stoner, but he then proceeded to achieve his first win in the top category. This was at the Chinese Grand Prix, where he achieved an historic win, accompanied on the podium by his teammate Nicky Hayden, once again confirming the huge potential of the Repsol Honda Team, which would take the MotoGP Constructor’s championship at season’s end. From race to race, Dani continued to show signs of his promising future in the category, including thrilling duels with Valentino Rossi and Melandri in Germany and the Czech Republic. This season did not lack a certain dose of drama, the most pertinent example coming in the penultimate round of the championship, when Hayden’s title hopes were at risk. The scenario was the Estoril circuit, on the fifth lap of the race; Dani made a mistake that left both riders on the ground, delaying the excitement of the championship to the final race in Valencia. At the Ricardo Tormo circuit in Cheste, excellent teamwork from the riders allowed Nicky to be crowned the MotoGP World Champion, the Repsol Honda team to take the Constructor’s title and Pedrosa to be proclaimed Rookie of the Year—the perfect end to an incredible season. 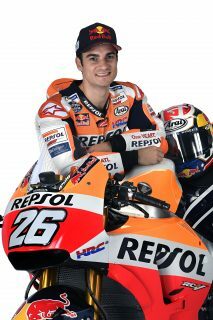 In 2007, Dani set out as one of the favourites to take the top category title. It was a year that started with a change in the MotoGP regulations, obliging constructors to limit their engine displacements to 800cc, and tyre suppliers to provide a set number of tyres for each race. From the start, three riders stood out as title hopefuls: Pedrosa, Rossi and Stoner. The young Australian was not on many lists of favourites before the season started, but with an impeccable season, he proved to be the rider that had best adapted to the change in regulations, winning the World Championship. Pedrosa’s season had started with two podium finishes in the first two races, but things changed at the next Grand Prix, in Turkey. Dani was knocked down by a rival in the first lap, and two weeks later, problems with his tyres left him far behind the leading group. Then came the rainy French Grand Prix, a scenario where Dani managed to shake off all of his past ghosts and put in a great performance that carried him to a fourth-place finish. The excitement and performance continued at venues like Mugello and the Circuit de Catalunya, where once again the Spaniard played a leading role in one of the most closely fought races of the season, along with Rossi and Stoner. The rain in England and setup problems in Holland left Dani out of the leading positions, where he returned two weeks later at the German Grand Prix. This boosted his motivation in a season filled with complications, such as that which occurred one week later in Laguna Seca, where tyre problems left him in fifth place. After the summer break, things did not go much better, as Pedrosa was knocked down by a rival in the first turn at the San Marino Grand Prix. In spite of this, Dani was able to reward his fans with an exciting race on the Portuguese circuit of Estoril, where he fought up until the last metre with an untiring Rossi, his rival for second place in the Championship. The final leg of the season showed Dani’s dominance in the practice sessions, as he took pole position at the last four races. However, these good sessions were not always repeated in races, due to falls in the rain at the Japanese Grand Prix and tyre problems in Australia and Malaysia, where he nonetheless managed to finish on the third step of the podium. Pedrosa’s efforts throughout the season were finally rewarded at the last race of the championship in Valencia, where he achieved an outright victory that allowed him to become the runner-up in the World Championship. Eight podium finishes, two of them on the top step, summed up his second year in the top category and set a solid base to extend his list of achievements. In the first winter training test of 2008, held at the end of January in Malaysia, it was clear that things were not going to be easy. Pedrosa clocked the second-best time but finished early due to an unfortunate fall that resulted in a broken right metacarpal, affecting his pre-season training and the beginning of the season, and interrupting the development of the RC212V. Dani arrived at the first night race in history, held in Qatar, without having fully recovered and with a bike that was a long way off the ideal setup. However, after a huge effort from the team, and an outstanding performance from the Repsol Honda rider, he took third place, which felt like a victory to him. Actual victory arrived at the second race, in Jerez, where Dani swept the board in a faultless weekend. For the first time in his career, Pedrosa led the MotoGP World Championship standings, after riding out a disastrous winter. The Repsol Honda rider secured the lead in the general standings by finishing second in both Portugal and China. However, in France, in spite of dominating the practice sessions, problems with his front tyre stopped him from progressing higher than fourth place. This showing was followed by a podium finish in Mugello and another overwhelming victory in Catalunya. Showing great consistency, Pedrosa finished third at Donington Park and second at Assen, recovering the championship lead that Rossi had snatched away from him at Le Mans. But then came Germany. Under torrential rain, Dani flew around the Sachsenring on his way to certain victory, confirming his progress under conditions that would have made him struggle in previous seasons. A win would have allowed him to extend his points lead, but a fall fractured his hand once again, leaving him without any points in Germany and preventing him from racing a week later at Laguna Seca. After the summer, things did not improve in the Czech Republic, where serious tyre problems prevented Dani from scoring more than one point. He was out of the fight for the title, and now his aim focused on becoming competitive again as soon as possible. 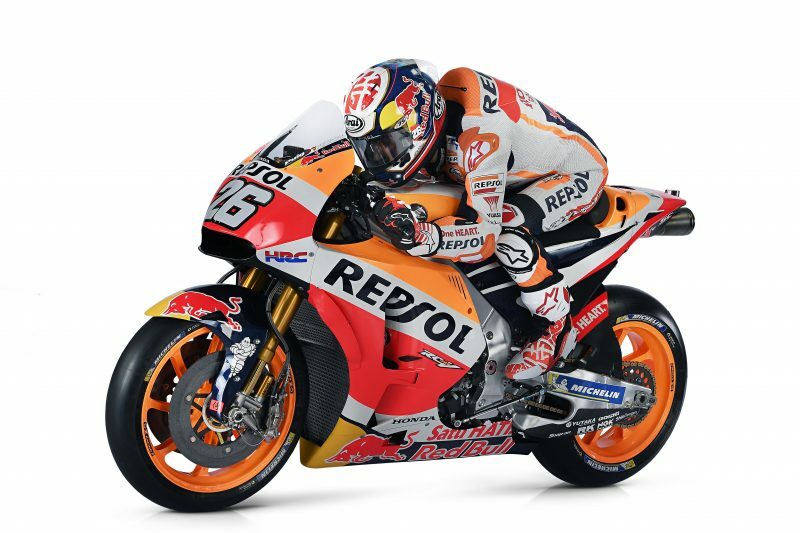 With this spirit, he finished fourth in Misano, but after the race, it was announced that the Repsol rider would use Bridgestone tyres on his Honda for the rest of the season. In the final part of the World Championship, the MotoGP circus travelled to Indianapolis. 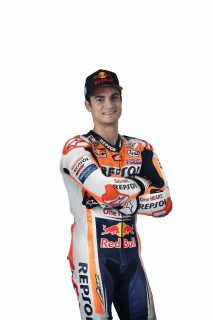 With the tail of hurricane Ike lashing the circuit, Pedrosa finished eighth, two weeks before achieving his first podium finish on the new tyres. The following Sunday, an error threw him to the ground on the first lap, and Dani ended the season on the second step of the podium in Malaysia and Valencia. In the end, a season that had started full of doubt showed a fantastic Pedrosa dominating the World Championship up to the halfway point and ending his year in third place overall. Dani had still not completely recovered from an injury to his left knee, which forced him to undergo surgery after a nasty fall in the second test of 2009 and miss the rest of the pre-season tests. Five weeks later, the Repsol rider confirmed in his blog that he would compete at the first Grand Prix of the season in Qatar. Physically weakened and without having completed development of his Repsol Honda RC212V, Pedrosa finished 11th in a race atypically held on a Monday, due to the downpour that had fallen on Sunday. It did not take him long to get good results in the following races, as he posted three podium finishes in a row in Japan, Spain and France. The improvement to his knee and physical form was apparent day to day, but while Dani was still a long way off being on top form, he was injured again during a practice session at the fifth race of the season, in Italy. In the race, with the track half-wet and half-dry, Pedrosa pitted to change bikes. Still affected by the previous day’s injury, he then fell, registering his first zero of the season. Dani arrived at the Catalunya Grand Prix without time to recover from his new injury, although he finished sixth, which contrasted with another fall in the Netherlands. Pedrosa clearly needed to pick himself up again, and he did so in the best way possible: an unforgettable win at the USA’s spectacular Laguna Seca circuit, where no Spaniard had ever won before. Prior to the summer break, Dani notched another podium finish in Germany, which contrasted with the problems he had at Donington Park, where he finished ninth. After the summer, he was second in the Czech Republic a week before returning to the USA (this time to Indianapolis). After dominating the practice session and with his win in Laguna Seca still fresh in the minds of the fans, Pedrosa was the favourite to win until he fell on the third lap, finishing tenth. In the final races of the championship, the Repsol rider again demonstrated his consistency and talent, taking podium finishes at the last five races: three third places in San Marino, Portugal and Australia; a second place in Malaysia and another win at Valencia. He finished a difficult season in third place in the final overall standings. 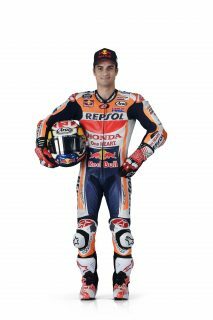 After somewhat irregular pre-season tests, Pedrosa arrived at the 2010 Qatar Grand Prix full of confidence, but aware of the shortcomings of his RC212V. The first round was difficult for the Spaniard, who had to settle for seventh position, but in Jerez—his “lucky charm” track, where he had already secured two wins and three second positions in the previous five years—he took pole position and finished second in one of the hardest-fought races of his career. At Le Mans, Dani took part in his 150th race in the World Championship and, a corner before the end, he dropped from third to fifth position. He had to wait for success until the Italian Grand Prix, where he took the first step of the podium and reached second place in the standings. At Silverstone, he could do no better than eighth position due to a mistake in tyre choice, but in Assen and Montmelo he recovered again by taking two consecutive second places. Pedrosa calmly faced the German Grand Prix, where he took his second win of the season. At Laguna Seca he tried to get his second win in a row, but crashed. After reaching the halfway point of the championship, he returned to the second step of the podium at the Czech Republic’s round. The team’s great work and the consistent effort of the Repsol rider allowed him to achieve two consecutive victories: in Indianapolis—one of the most demanding tracks and in especially difficult conditions—and San Marino, where he started from pole position and set up the opportunity to earn a “hat-trick.” The third victory in a row just wasn’t to be, as Pedrosa finished second in the first GP held at the Aragon circuit. With the championship battle still very much alive, the Repsol Honda rider fell again during practice at Motegi, suffering a double collarbone fracture that retired him from competition for two rounds—Japan and Malaysia. Having undergone surgery, Pedrosa was back to racing in Australia, but after Saturday practice, the Catalan rider realised that it was too soon. It was finally in Portugal were Dani raced again, achieving a well-deserved eighth position despite still being bothered by his injury. In the last round of the World Championship, he finished seventh, which was enough to retain his place as runner-up—a superb result after missing some rounds and not being able to compete at his best. The 2011 pre-season in Sepang was one of the most promising of recent years. The Repsol Honda Team dominated the timesheets in the tests scheduled before the season-opening Qatar GP and Dani established himself as a clear title contender. 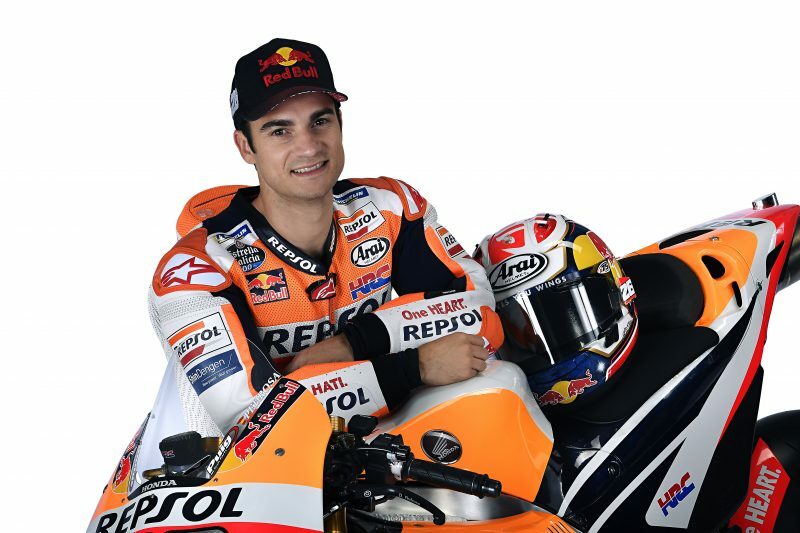 The Repsol rider and the RC212CV were ready to push for the highest honour in the World Championship. However, the start of his tenth season in Grand Prix racing was not the smooth title push that he expected. It began with a creditable third at Losail International Circuit, but the result was accompanied by the reappearance of a left-collarbone injury inflicted upon the Spaniard the previous season. He fought through the setback to win at the next race in Jerez, but took advantage of the gap in the calendar left by the postponed Japanese Grand Prix to undergo surgery. His return in Portugal brought a win and took Pedrosa right back into the battle for the title. However, one race later a crash caused in a controversial overtaking move by the late Marco Simoncelli would put an end to any hope of taking the crown. The collarbone fracture suffered in the collision at Le Mans meant that a second operation of the season was required and that he would miss the following three races. It would not be until the Italian Grand Prix that Dani would make his comeback, with an eighth-place finish. Fitter one race later, the Repsol rider claimed win number two of the season the next time out in Germany. It was just reward after some difficult months and was followed by another podium at Laguna Seca—a result that reiterated that he was back to his best. His most successful spell of the year came after a tough race at Brno: three second places in Indianapolis, San Marino and Aragón were capped off by a magnificent victory in Japan—Spain’s 400th GP win. With fourth place at Phillip Island, a cancelled Malaysian GP due to the tragic death of Simoncelli and a fifth place at the season finale in Valencia, Dani finished the season in a bittersweet fourth place overall, with three wins and nine podium results. He failed to take points in five races due to crashes and injuries. In 2012, Dani enjoyed seven victories and 15 podiums—his most successful run in the premier division—and his victory total was one more than eventual World Champion Jorge Lorenzo. 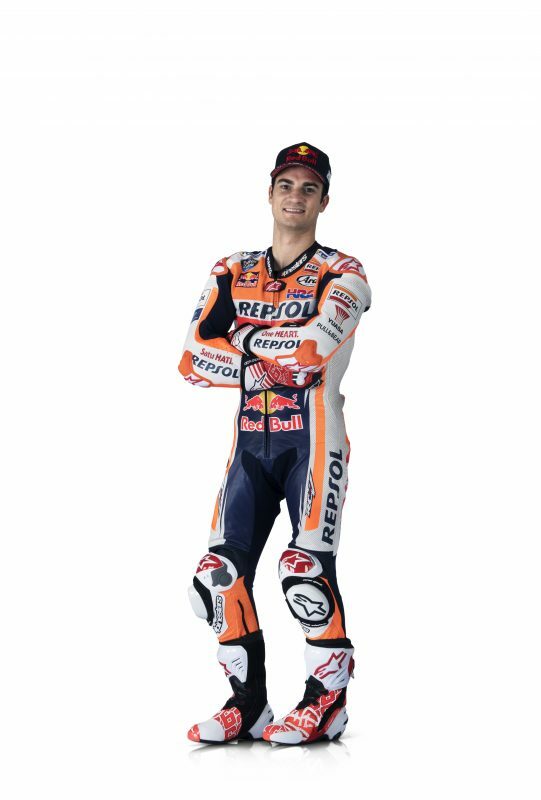 Wary of his bad experiences with injuries early on in previous seasons, Pedrosa rode prudently for second and third places in the opening races before launching his title challenge in earnest, notching victories at six of the last eight races. Dani showed that he was a more well-rounded rider in 2012 than in previous years, taking a valuable wet-weather victory and improving his ability to bash fairings alongside his rivals. The stats from the end of the season reflect this: He topped the podium on seven occasions (Germany, Indianapolis, Czech Republic, Aragón, Japan, Malaysia and Valencia), placed second in Qatar, Catalunya, Holland and Italy, and was third in the Spanish, Portuguese, British and U.S. rounds. In races he completed, Pedrosa finished off the podium in just one—the French GP. After an incredibly strong finish in 2012, Dani was in perfect form to attack for the 2013 World Championship. He dominated pre-season testing in Sepang, topping the time sheets on five of the six days, and entered the season injury-free. After struggling in Qatar, where he took fourth place in the race, Dani was soon back near the top with a second-place finish in Austin and then back-to-back wins at Jerez and Le Mans. Following strong second-place finishes in Mugello and Catalunya, Pedrosa had issues in Assen and was only able to finish fourth. Then a serious crash at the Sachsenring ruled him out of the race, and further examination confirmed a crack in his collarbone. Dani worked hard to be fit for the following round just one week later at Laguna Seca. He knew he needed to earn points, even though the risk of crashing could be devastating for his Championship, and he emerged fifth at the end. During the welcome summer break, Dani was able to rest and heal in preparation for the second half of the season. He returned from the rest period determined and took two second-place finishes in Indianapolis and Brno and two third places in Silverstone and Misano. An unfortunate crash at Aragon with teammate Marc Marquez all but finished Dani’s title campaign, but he continued to fight to the end, winning in Malaysia, finishing second at Phillip Island and third in Japan, and he finished the season with a strong fight against Lorenzo in Valencia, finishing second. With 300 points, Dani finished just 34 behind World Champion Marquez, and 30 behind Lorenzo. As Marquez ran away with the first 10 races in emphatic fashion, the rest of the riders were left searching for the secret to beat the young Spaniard, and Dani was the first to find it with his victory at round 11 in the Czech Republic. With 10 podium finishes in 2014, Pedrosa was fighting for second place in the Championship—as Marc had made it his to lose—but bad luck once again hit Dani. Wet weather during the Aragon race left him with zero points, and retiring from the Australian race after being hit all but ended his challenge for the runner-up position. He was leading the Malaysian GP—the penultimate race of 2014—but unfortunately crashed out, making it three no-score finishes in four races. Dani ended the season in fourth place. Dani didn’t have the best start to the 2015 season, but he definitely finished it on a high note. The Spaniard took a sixth-place finish at the opening race in Qatar and was then forced to miss three consecutive rounds in Texas, Argentina and Spain, having elected to undergo surgery to alleviate a serious arm-pump condition. The operation was successful, but Pedrosa was obviously not fully fit when he returned to racing at Le Mans. He finished the French round in 16th place after crashing his RC213V and displaying grit and determination by remounting to complete the race at any cost. In the Italian race at Mugello, Pedrosa managed a much better result, finishing fourth, but it was his home round—the Catalan Grand Prix two weeks later—that saw him back on the podium for the first time of the season, third behind Jorge Lorenzo and Valentino Rossi. After placing eighth at Assen, he again climbed the podium in Germany, finishing second behind his teammate for a Honda 1-2. Dani went on to achieve solid results in Indianapolis, the Czech Republic, the UK and San Marino before producing one of the best rides of his MotoGP career at Aragón, where—after engaging in a thrilling battle for the win with Rossi over the last five laps—he finished runner-up by just nine-hundredths of a second. Dani’s first victory of the season came at the next race, on Honda’s Japanese home turf, ensuring he would extend his streak of scoring at least one victory every season since moving to the premier class. In Malaysia he added a second victory to his record book, totalling 140 podium finishes in his career—one more than 13-time World Champion Angel Nieto and the most of any Spanish rider. In reaching the third step of the podium at the season-closing race in Valencia, Dani finished the year fourth in the standings and reached 100 podiums in the premier class, a milestone that had previously been achieved only by Valentino Rossi. Pedrosa had a difficult start to the 2016 season despite scoring two third places – in Argentina and Catalunya – but came on strong in the second half . He gave his best to overcome the difficulties he had encountered since the major changes to MotoGP’s technical rules, working hard with his team to find a set-up that could give him enough confidence to fully exploit his bike’s potential. Finally Dani and his crew found a promising direction with set-up at the Brno post-races. 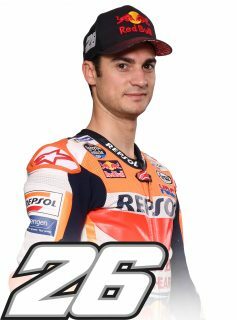 He finished just off the podium at the British GP and took an awesome victory – his 29th in MotoGP, and 52nd in career – at the subsequent San Marino Grand Prix. Charging through from eighth on the grid, and sixth on lap one, he dove past team-mate Marc, Dovizioso, Vinales, Lorenzo and finally Rossi, setting the new lap record on the way. Misfortune struck him a hard blow two races later at Motegi, and Dani was side-lined by a crash that left him nursing a broken right collarbone, left fibula and toe. The brave Spaniard once again fought back to recover as soon as possible and was able to return to his team and his bike for the Valencia finale in November. Dani finished the year sixth in the standings. The 2017 season saw Dani tackling his 12th year in MotoGP and with the Repsol Honda Team, and it proved to be quite successful, though some up-and-down results prevented him from fighting for the title in the end. A decent fifth-place finish at the weather-affected opening round in Qatar was followed by a crash from fourth place in Argentina. Two weeks later Dani took his first podium result of the season, posting a solid third-place finish in Texas after leading in the early going. With his teammate winning the race, it was also the first of what would be eight double-podium finishes for the Repsol Honda Team during the course of the season. Back in Europe, Dani posted a master-class victory at the Gran Premio Red Bull de España ahead of his teammate, after starting from pole position and leading the race from the first corner to the chequered flag and setting the race’s fastest lap. 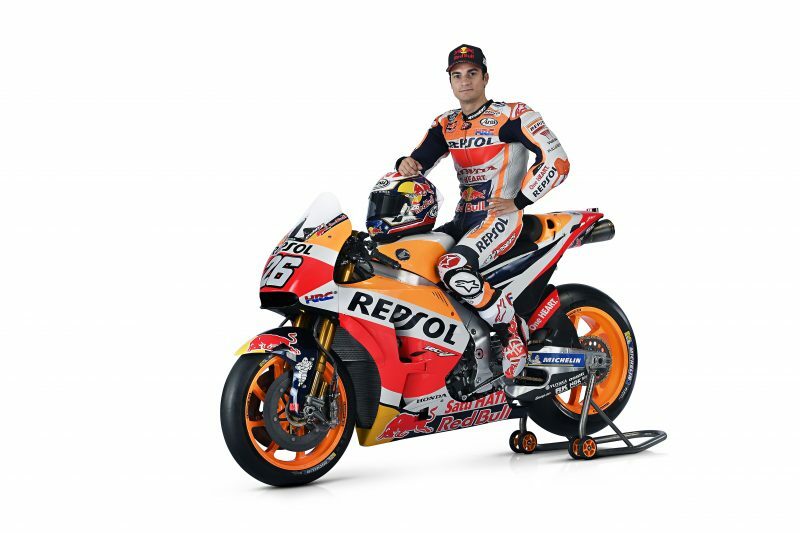 In winning the 3,000th Grand Prix race ever held, Dani also earned the Repsol Honda Team’s 100th victory in the MotoGP class and became the only rider to have won at least one race for 16 consecutive years. The Spaniard’s good form continued at Le Mans, where he scored his third consecutive podium finish after starting from the 13th spot on the grid. On the other hand, Italy proved to be difficult for Dani, who crashed out of 11th position on the last lap of the race in Mugello. Things went much better on home turf in Catalunya, where he took third just behind Marc, for the Repsol Honda Team’s third double-podium finish of the season. A very tough TT Assen in changing conditions resulted in a 13th place finish, but Dani took his revenge immediately thereafter, with a third-place result at the Sachsenring for the squad’s fourth double-podium, just before the summer break. When the season resumed in August, Dani took back-to-back podium finishes in Brno (second) and Austria (third), bringing the team’s double-podiums tally to six. Struggling on the bumpy surface of the Silverstone track, Dani managed to finish seventh but had a very tough race at the following round, the wet San Marino Grand Prix, as he was unable to put temperature in his tyres or push as he wanted. Ultimately, Dani had to settle for 14th place at the same track where, in sunny conditions, he had dominated the previous year. Back on home tarmac at Aragon, he returned to the podium alongside his teammate for the seventh time of the season. The three flyaway races proved to be quite challenging, with a DNF, a 12th place, and a fifth place in Japan, Australia, and Malaysia, respectively, but the final showdown in Valencia brought Dani a great win, his seventh at the track across all classes, his 54th in career, and his 31st in the MotoGP class, also contributing to the Repsol Honda Team’s eighth double-podium finish. Dani finished fourth overall in MotoGP Championship Classification. Dani has won at least 1 race for year for the last 16 consecutive seasons, meaning that he has won at least one race in all his 13 seasons in MotoGP. Dani is the only rider in MotoGP history to have achieved that. 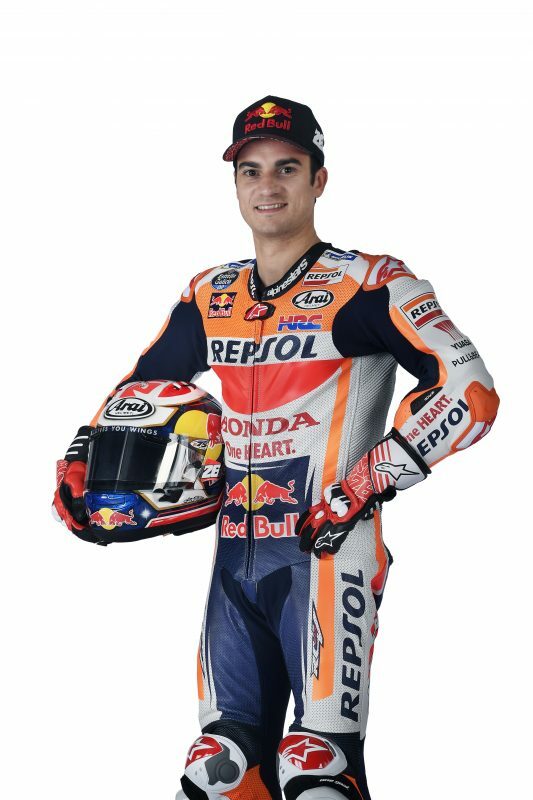 Taking the win of the Valencia GP in 2017 Pedrosa became the 7th most successful rider in history with 54 victories across all categories.